The mobile advertising market, as we heard earlier today, will be worth $14 billion in 2014, and it looks like Android is getting ever closer to dominating it. In Q4, Android-based smartphones, for the first time, surpassed the iPhone in terms of mobile ad impressions on the Opera Mediaworks ad network, with a 36% share compared to 28.7% for the iPhone. Opera’s network covers 60 billion impressions monthly, 425 million users and 14,000 sites and apps, so it is one barometer of how well mobile platforms are doing respective to each other. In one regard, given that Android handsets outnumber those of any other platform, finally beating out on impressions is not too much of a surprise. In fact, when you think about it, it’s a mark of how much iPhone devices are used by their owners that they had managed to lead on impressions for as long as they have. That pole position continues to be the case in terms of revenues and when you factor in impressions across tablets. In terms of impressions, iOS overall too just over 43% of all impressions, compared to just under 38% for Android devices. And in cases of money, Apple’s platform took nearly 56% of revenue across both smartphones and tablets in the three months, compared to Android’s 32%. If you break out phones alone, the margin narrows to 40% iPhone and 30% Android phones. The implication here is that iOS continues to be the more monetizeable platform — users engage on it more frequently and for longer. But just as the balance has now shifted on impressions on phones, the question now is whether — or when — Android will reach parity with iOS on the revenue side. The implication of having a smaller and less monetizeable platform goes beyond telling media buyers where to place their ads: it becomes a message to developers and the wider ecosystem about what to prioritize when making new apps, hardware and more. 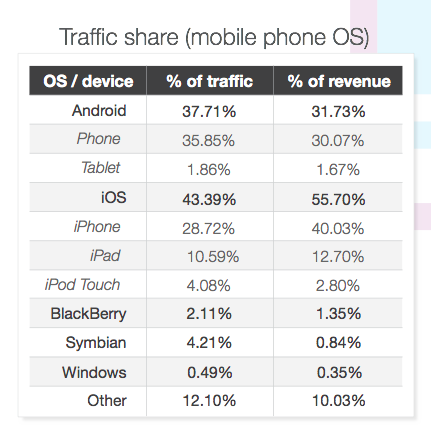 Given the way that device purchases and shipments have been playing out over the last couple of years, it should come as no surprise that other mobile platforms lag behind significantly, with BlackBerry, Windows Phone and Symbian all below 5% in terms of traffic and revenue. What’s perhaps more surprising is that their percentages are actually small even in proportion to shipments, implying that perhaps Microsoft and Blackberry have a double worry ahead: getting people to buy their devices and creating sticky services. The disparity between revenues and impressions continues through to the kind of content being consumed on mobile networks. While social sites are by far the biggest traffic driver at 34.25% of all impressions, when it comes to revenues, music, video and media are proving more monetizeable, with 20.6% of all revenues.